Here’s a healthy sheet pan meal the whole family will love. Roasted veggies and black beans, served in corn or flour tortillas, drizzled with our creamy Cilantro-Lime Dressing, Enjoy! CILANTRO-LIME DRESSING: Add sour cream, mayonnaise, lime zest and juice, jalapeño, cilantro, cumin, salt and pepper to a food processor fitted with a blade attachment or blender. Blend until smooth. Refrigerate until ready to serve. ROAST VEGETABLES: Preheat the oven to 425 degrees. Line a large rimmed baking sheet with parchment paper or foil. 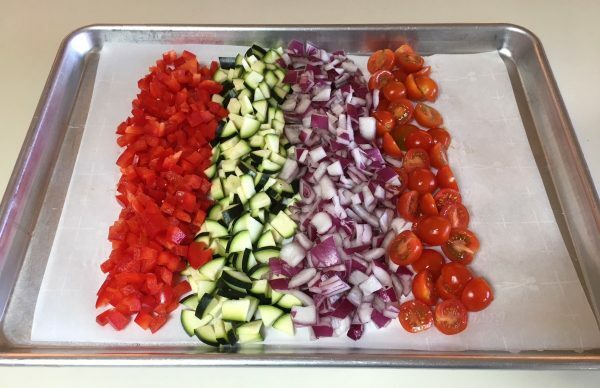 Place zucchini, onions, bell peppers, and tomatoes onto the baking sheet. Drizzle with olive oil. Scatter 3/4 teaspoon of chili powder, cumin, and a few pinches of salt over the vegetables. Toss to coat. Roast in the oven stirring occasionally until tender, about 20 minutes. Meanwhile, in a small bowl, combine black beans, remaining 1/4 tsp. chili powder and a drizzle of olive oil, stir to combine. Add beans to the baking sheet with vegetables. Continue to roast for an additional 5 minutes or until the beans are hot and vegetables done. WARM TORTILLAS: Microwave Method - Wrap 6 tortillas in a slightly damp paper towel. Place on a microwave-safe plate. Microwave the tortillas on HIGH for 30 seconds. Check them after each 30-second period, if they need longer, flip them over and microwave for another 30 seconds. Repeat until they are warmed through. Oven Method - Wrap tortillas in 4 stacks of 6 with aluminum foil. Place into a preheated 375 degree oven for 10 to 15 minutes, or until heated through. TO ASSEMBLE: Fill each warmed tortilla with vegetables and black beans. Top with avocado, pickled jalapeños, and a drizzle of the cilantro-lime sauce. Serve with limes and extra sauce on the side.